Most homeowners tend to forget the most visible part of their kitchen when they are planning for their home or kitchen improvement. If you have been living in your home for quite some time, perhaps it is about time that you take a look at your cabinets and give them a serious makeover. Cabinet refacing in Overland Park, KS is one the most wonderful ways of giving new life to your cabinets without hurting your wallet. Cost-Effective - Cabinet refacing in Overland Park, KS is guaranteed to help you save up to 50% of the price of new cabinets. It can also save you the cost of cleaning your kitchen area and replacing your wall and flooring. Now, that’s is a lot of money that you can use in your other kitchen improvement plans. Save Time - Overland Park, KS cabinet refacing will surely save you a lot of time. Installation of new or replacement cabinets usually takes about 4 days to a week. However, refacing your old cabinet can be done in just 2 to 3 days or less depending on the number of cabinets in your kitchen. 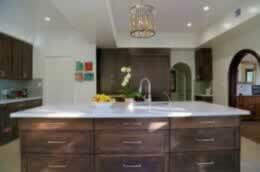 Home Value - Don’t forget that cabinet refacing in Overland Park, KS is still a home improvement project. Any home improvement will surely add value to your home.